Thick, hearty waffles with a subtle carrot flavor and bursts of sweet, juicy raisins. Simple enough, and very simple to make. I was expecting more of a carrot cake-ish flavor, but the carrot was far removed from the flavor foreground. That wasn't necessarily a bad thing, but it just wasn't what I thought. The waffles themselves weren't very sweet, so the raisins definitely added a much needed sugar rush. Of course, waffles are meant to be drowned in syrup anyway, right? But once again, the syrup masked the carrot flavor. 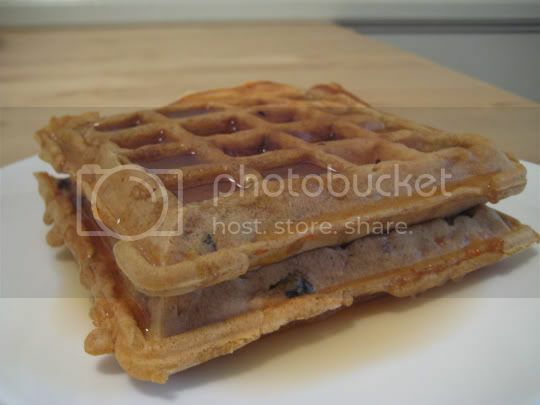 In fact, I think the raisins were the highlight of these waffles, along with a nice pronounced cinnamon spice. The waffles were just a tad on the dry side, but again...isn't that what syrup is for? Make again? I suppose. They weren't too memorable though.